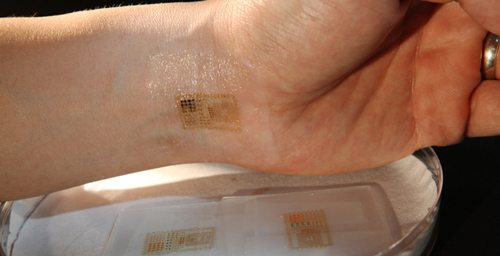 An ultrathin, electronic patch with the mechanics of skin, applied to the wrist for EMG and other measurements. The circuits' filamentary serpentine shape allows them to bend, twist, scrunch and stretch while maintaining functionality. 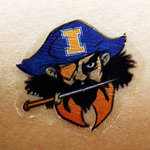 The patches are initially mounted on a thin sheet of water-soluble plastic, then laminated to the skin with water - just like applying a temporary tattoo. 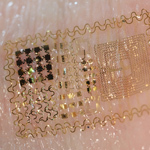 Alternately, the electronic components can be applied directly to a temporary tattoo itself, providing concealment for the electronics. Skin-mounted electronics have many biomedical applications, including EEG and EMG sensors to monitor nerve and muscle activity. 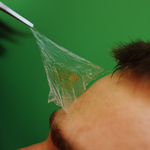 One major advantage of skin-like circuits is that they don't require conductive gel, tape, skin-penetrating pins or bulky wires, which can be uncomfortable for the user and limit coupling efficiency. They are much more comfortable and less cumbersome than traditional electrodes and give the wearers complete freedom of movement. Editor's note: To contact John Rogers, call 217-244-4979; email jrogers@illinois.edu. 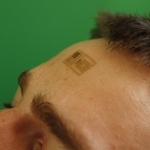 The paper, “Epidermal Electronics,” is available from the News Bureau.